We occasionally visit my home in the UP. Jim Harrison is one of my favorite authors, partly because many of his novels are set in my birthplace of the Upper Peninsula (UP) of Michigan. The UP is a sparsely populated area the size of Maryland that forms the southern shore of Lake Superior. It is in my mind, a distinctive place in homogenized suburban America and has a culture of its own. He is from the northern part of lower Michigan and a graduate of Michigan State University. He is most known for the novella that became a movie, Legends of the Fall. The Big Seven is one of his last books, written in 2015, a year before he died of a heart attack. It is not one of his best, but it was an enjoyable read. He goes back to a recurring character, Detective Sunderson, a retired state policeman and the detective that lives in Marquette, Michigan. It is a crime novel dealing with a violent, poor family living in the western Upper Peninsula. I love his references to life in the UP, like pasties, and his description of the people, places and lifestyle there. You can tell he knows the area. The detective story is a page turner, not for the crimes itself, but for what was going on with Sunderson. I do have problems with the book. The main character Sunderson is in his late sixties, eats too much and drinks a lot, but is picking up women constantly. I just don’t believe so many beautiful young women are into retired, out-of-shape, alcoholics. He also constantly describes Sunderson’s drinking habits. Some of it felt like filler and a good editor would have helped him. The title comes from the Seven Deadly Sins. Sunderson is trying to write an essay or novel on his “eighth sin” of violence but is slowed by his drinking and laziness. Jim Harrison was a literary figure like one of my favorite authors when I was young, Ernest Hemmingway. An adventurer with a zest for the good life whose writing set in places like the American west and northern Michigan. The book made me consider going back to Hemmingway now as a middle-aged man to see how my perceptions of his writing have changed in the last 25 years. This past week I spent the week visiting my hometown of Caspian, Michigan for the first time in over 5 years. I will be uploading posts from the week as I get them completed. We had slow internet at my house and I am working on a project for my doctorate and had limited time to write. I hope to get several posts up reflecting on our trips this summer. One of the attractions that everyone should see when they are in the western part of the Upper Peninsula of Michigan is seeing the mysterious Paulding Lights. This is a natural or unnatural phenomenon, depending on who you believe. The lights were first reported by teenagers to the police in 1966, and ever since, it has been a tourist attraction. The lights were featured on a SyFy channel program. They are similar to the Marfa lights in west Texas. Paulding is a tiny, unincorporated village located about a 40-minute drive north west of my hometown of Caspian in Michigan’s Upper Peninsula. 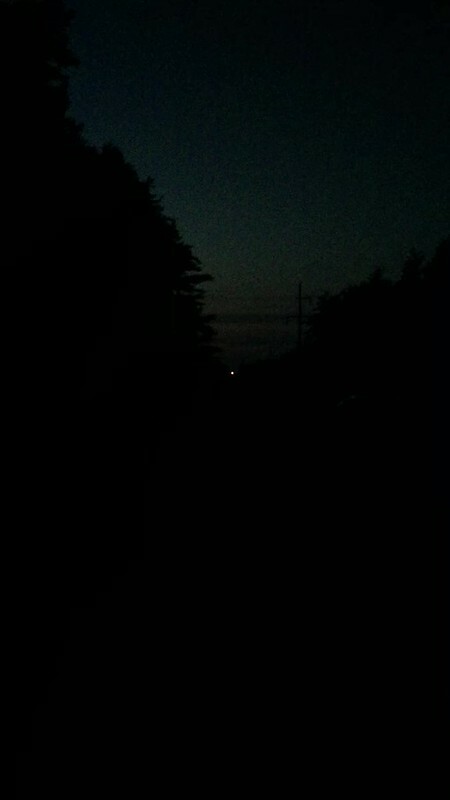 Mysterious lights, hovering and bouncing in the distance horizon above the trees could be seen at the end of a side road off Highway M-45. We have been there several times, both in summer and winter and there are always a few people there. Paulding is not exactly easy to get to, but tourists and locals from northern Wisconsin and the Upper Peninsula. On this trip, some guys in a truck were getting stoned and another family was recording the lights with their phones. This time my brother and I took the kids for the first time, so we played up the unnatural phenomenon theory. A train employee was run over while working on the lines and ever since then, his ghost swings his lantern to warn others. Others speculate UFOs or I heard some other stories. We had the kids good and scared when we approached the dead end, marked by a roadside metal fence. There is an ATV trail that leads towards the lights, so we hopped the barrier and walked to the lights. About 200 yards from the barrier, there is a small bridge above a beaver dam and after about 30 minutes, we turned around. We saw the lights, but couldn’t work out with the naked eye, what exactly was causing them. Michigan Technological University researchers discovered that the lights are car headlights and tail lights from passing cars on M-45. An atmospheric inversion has a magnifying effect and allows people to see eerie lights hovering above trees in the distance. I am not sure how that works. It was a classic UP adventure and the kids loved getting scared and walking through the refreshing pine forests at night. Yesterday we ran our final race this summer. The Windsor Center (building behind me) hosted a 5K and 10K run. The Windsor Center is my old high school. As the population dwindles in my hometown, schools are consolidating and there are more empty former school buildings. A group of citizens are trying to use the building benefit the community and so they are raising money to keep it open and develop it for other things besides classes. It is also Rodeo weekend here in Iron River. Annually, the town holds a rodeo and it attracts many tourists. The rodeo performers are part of a semi-professional regional circuit and this is one of their tour stops. 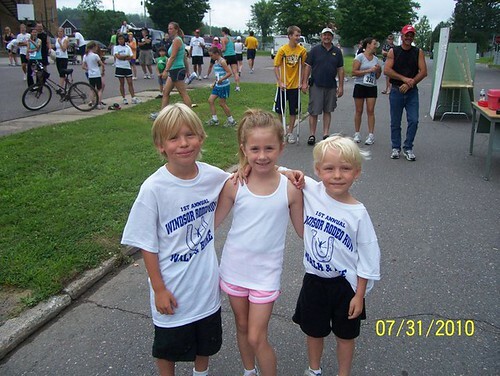 This was the first time in several years that they held a road running race in conjunction with the rodeo. I would like to thank Dawn Pisoni and the people at the Windsor Center for making it happen again this year. Nadia ran the 5 kilometer race and won her age group with an amazingly fast time of 24 minutes. That is about 6 minutes faster than her times a few years ago in Venezuela. I ran the 10 kilometer and finished third in my age group with a time of 4 7:20. We both earned medals and it completed a successful summer of running with us competing in three races (Bass Run, Canal Run, Rodeo Run). I am inspired to continue to train and get more serious about my running. That is of course, time permitting. At least we would like to get more serious about running. Hopefully, we can do it this school year. Owen and Ollie also got into the act with the Kiddie Race. It was a 70 yard dash and both boys did well. They won participation ribbons, so we all came away with something to put in the trophy case. 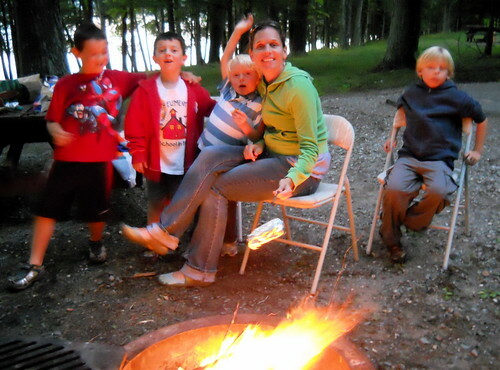 The kids are pictured below with their friend, Avery. We want them to enjoy running and being active and events like this will help it. 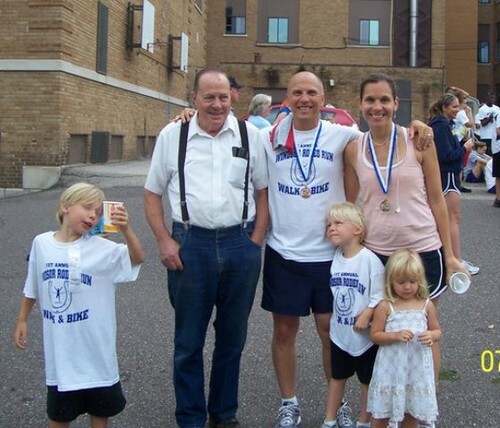 In the photo above, we are pictured with my dad, who was the Master of Ceremonies for the event. It was a fantastic morning! Nadia, originally uploaded by bill kralovec. 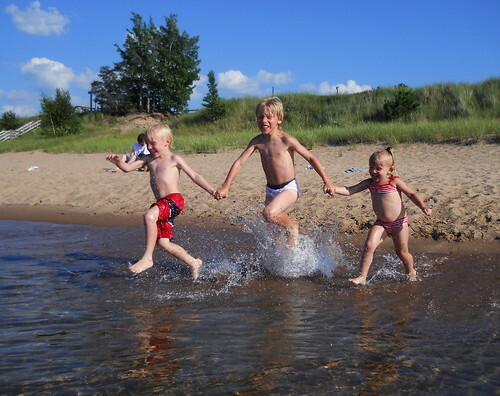 The water temperature of Lake Superior this summer is15 degrees (F) above average. Yesterday we had a doctor’s appointment in Marquette, so we took advantage of the beautiful, sunny day and spent the day at the beach. 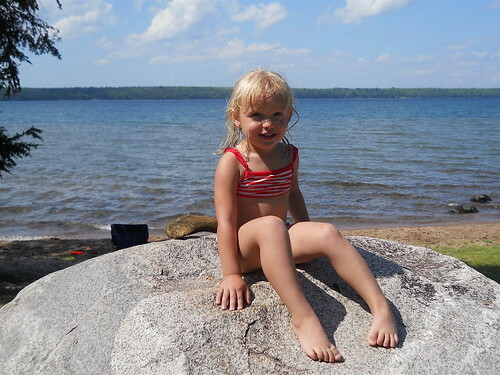 We found a nice sandy beach near Harvey, Michigan, just east of Marquette. It looked like the Caribbean, so much so, that Nadia actually swam in the Lake for the first time ever. 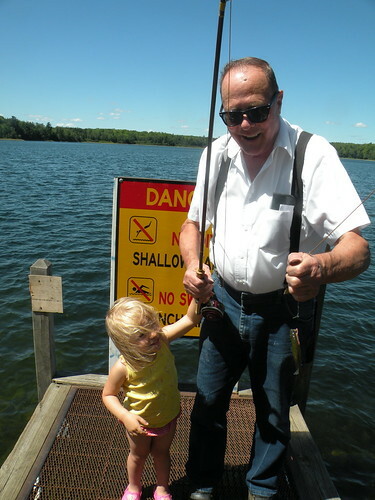 We had a great day of fishing today at the Indian Lake boat landing. The boys and Ocean pulled up many bluegills and one perch. Owen even caught a couple on his own. 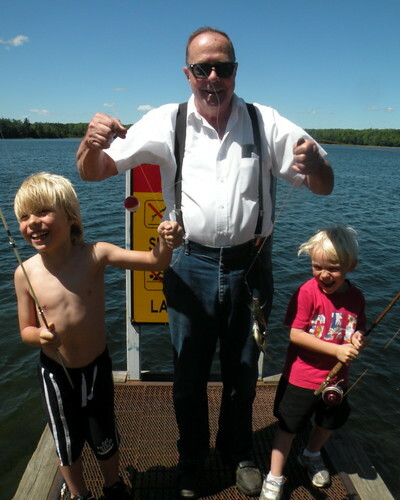 Grandpa was a champion, baiting and hooking fish for the kids to land. We had great fun with so many fish. 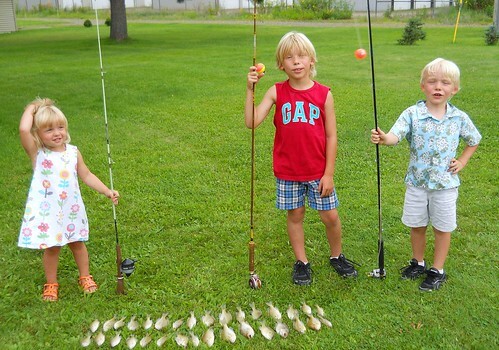 It didn’t matter that they were small, anything on the hook was an exciting moment for the kids. A big thanks to Hoover for the fishing tips. Ocean Caught a Fish, too.